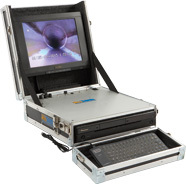 Ratech’s Elite-D© DVD-R/HD features a 15" Hi-Res Flat LCD screen, a state-of-the-art DVD recorder AND an 160 gigabyte fast hard drive giving you one of the most advanced inspection systems available today. Take full advantage of the highest quality video DVD offers with the storage capability of a hard disk in one unit. The DVD recorder is accessible from the front of the unit making it convenient to record your inspections directly onto a DVD-R disk or the internal hard drive. You can record or “burn” video on the fly as you are performing your inspection just like video tape, but with much more capacity. An on-screen display overlay system is included providing on-screen footage, time, date and eight (8) pages of memory for listing problems and displaying of company information.